As I have previously mentioned, PixelJunk Eden has been a pleasant surprise. Interested in trying new things, I downloaded it with no expectations or knowledge of what the game was, aside from the odd comment from friends claiming it as one of the best games on the Playstation 3. Within minutes of my first session with the game, I wholeheartedly agreed. Obviously I'm still relatively new to Sony's console and as such, don't have the experience with it that many others do. Even so, I firmly believe that PJE (PixelJunk Eden) is an important game to the platform, particularly the Playstation Network. Featuring games like EchoCrome, Flower and PJE is a great thing, not just in what the games themselves offer in content but also because they're unique and form an identity for the platform which separates it from other online services. I think it is telling that by including these games on their service, Sony has attracted people to the PS3 that they wouldn't have with blockbuster titles such as Metal Gear Solid IV or LittleBigPlanet. In fact, I was almost one of these people. As soon as I saw it in motion at one of Sony's E3 conferences, EchoCrome jumped onto my radar and became a reason to buy the console. Like many however, I held off with the purchase due to the console's price, lack of games that I was interested in and even, slightly, Sony's arrogance that the console would sell eventually. I have already detailed my PS3 purchase here, however, so instead I will simply say that the more Sony releases games like this, the more it will form an identity that becomes as much of an important selling point for the console as the included Blu-Ray player. Surely that is no bad thing? Moving onto the actual game itself, I love playing PixelJunk Eden because I find it relaxing to play. It's a great game for me because it appeals to two different aspects of my gaming habits: on one hand I can fire it up for ten minutes, do whatever takes my fancy and just relax with it after a busy day. On the other, I can play it like I do most games by trying to locate all the Spectra within a level or trying to collect enough pollen to open up every seed. This balance between relaxation and motivated play is a nice one and it's one of the main reasons why I find it so enjoyable to spend time with. As fellow blogger Scott Juster from Experience Points mentions, it is also quite therapeutic, achieving this through rhythmic motions, a minimal yet effective soundtrack and hypnotic visuals. Speaking of the visuals, they continue to surprise. I have spent many hours with the game and yet just this evening I noticed something different about them. While playing I noticed the backgrounds are essentially just blank sheets (there are of course, some exceptions) which then led me to realise that by collecting pollen and nurturing the plants for growth, we are effectively painting the level onto this backdrop. Obviously this is just an observation and the levels will always be the same with subsequent visits, but noticing this different perspective on the game seems to fit when you consider its presentation is, to quote a friend I showed the game to, quite "artistic". 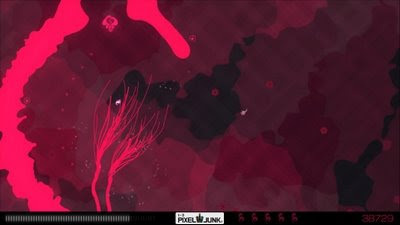 I agree with that description and find it an apt way to describe the visual elegance PixelJunk Eden manages to convey. The cool thing is that this is just one aspect of PJE's overall experience, one which while simplistic to play is also open to interpretation and can be viewed by many different perspectives. I can't wait to play more of this wonderful game and eagerly await what else is to come out of the PixelJunk series.